Did you know that over 40 per cent of travellers aged 18-34 have chosen a holiday destination specifically because they wanted to try a certain type of food? Good news, wouldn’t you agree? According to an ICE survey more and more young people are indulging in food tourism. The numbers are reversed as the age of those surveyed goes up; only 11% of people over 65 let their stomach do the decision making for them. It’s a shame that our older population isn’t so adventurous but it is nice to see that young people are willing to try and discover new things, food included. We love new foods and would be happy to take a trip just with food in mind. One of our dream destinations is USA, the land of real BBQ. Yes, seeing the Great Canyon, Niagara Falls or driving on Route 66 would be awesome and a once in a lifetime experience but visiting USA BBQ hot spots would give us much more pleasure. 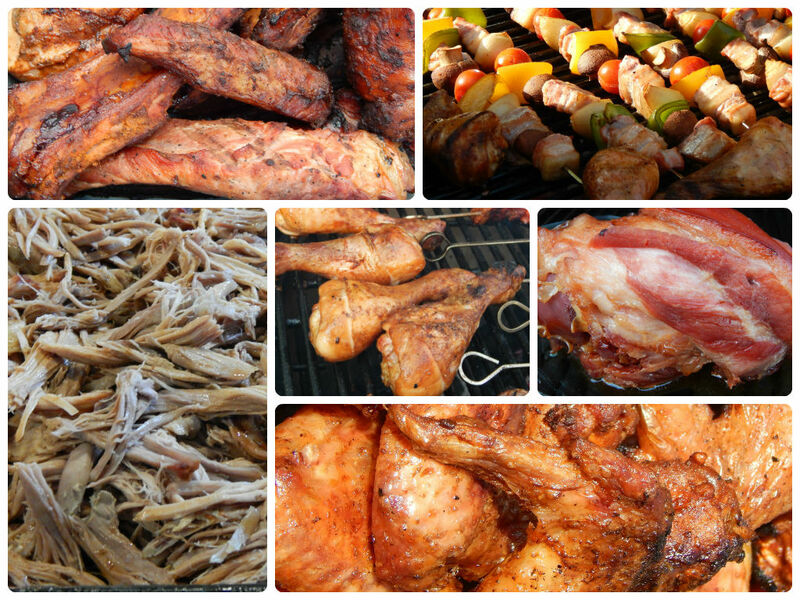 You might think “Hold on a minute, really, travelling to USA just to have a BBQ?” Yes, we would. Mainly because USA BBQ has nothing to do with blackened half burnt sausages that are still raw in the middle or poorly looking shop brought burgers, which tend to dominate UK BBQ parties. USA BBQ is a full on trip to flavour town that has elevated the humble BBQ to an art form; be it a pulled pork from Tennessee, hickory smoked brisket from Texas or glazed ribs from Missouri and please don’t even get me started on spicy chicken wings or any one of the variety of handmade burgers. USA is truly the chosen land in regards to BBQ. Mark and I like BBQ but we simply can’t afford to be travelling to USA every time we feel like having a pulled pork butties, so we decided to learn how to cook it ourselves and invested in some pieces of real BBQ equipment of our own. We bought ourselves a Primo. 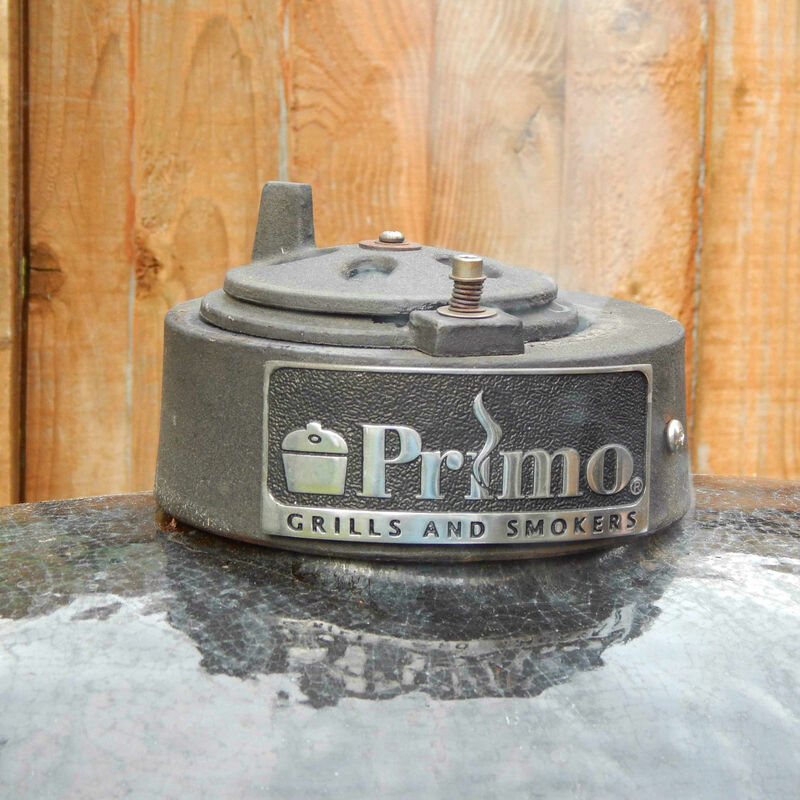 Primo is the USA’s most popular barbeque / smoker used for home or in a small industrial setting. No, you can’t buy it on the continent, if you want one you will have to import it from USA, but we have something similar over here called a Big Green Egg (we never considered buying it or used it and I can’t speak as to how good it will be comparing to our Primo). The main difference between your standard BBQ and a Primo is that the Primo works like a barbeque / smoker, so you get the best of both worlds, depending on what you cook and what you are trying to achieve. You can cook on an open fire, just like your standard BBQ or you can smoke stuff in it for hours and hours… We love it and use it all year round. Being ceramic in construction it is not scared of the winter rains or even snow and it is always ready for action. 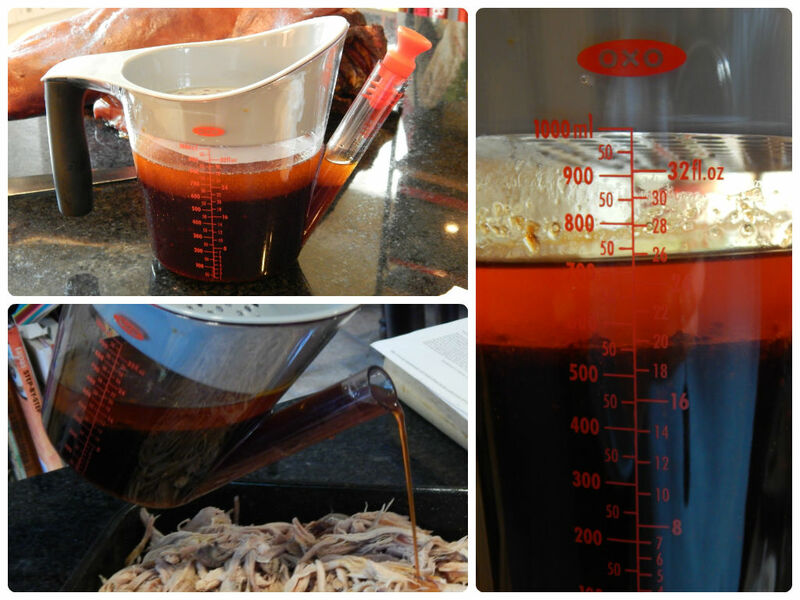 I would like to share with you a recipe for one version of the perfect pulled pork, not roast pork as it usually ends up being when sold in the UK but proper fall apart, melt in the mouth meat that just makes you smile – yes, it involves our Primo but not to worry you can simply do the same in the oven; obviously just skip the part where you would add wood chips to make the smoke – this wouldn’t be advised in the oven. If you really want to have some smoke taste on your pulled pork, on one oven cook we put some tea leaves in a tinfoil boat that we shaped and placed on the stove in an empty saucepan, when heated some lovely aromatic smoke will come. With some tongs carefully take the tinfoil boat of the heat and pop into the oven next to your meat. *You can’t buy it from your local supermarket; you will need a trip to a real butcher. 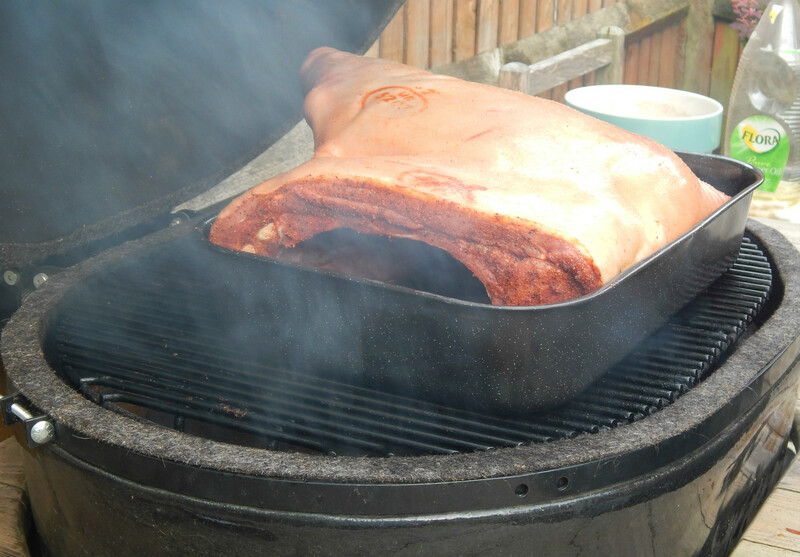 Decent size pork shoulder will cost between £30- £40. It might seem like a lot but it will feed a lot of people, or a few people for a long time. Though it is worth remembering that once people start eating the finished dish; the concept of sharing does tend to take a holiday for most of them. Rinse the pork shoulder and place in a large container, pour in the brine solution, and add water until it is completely covered. 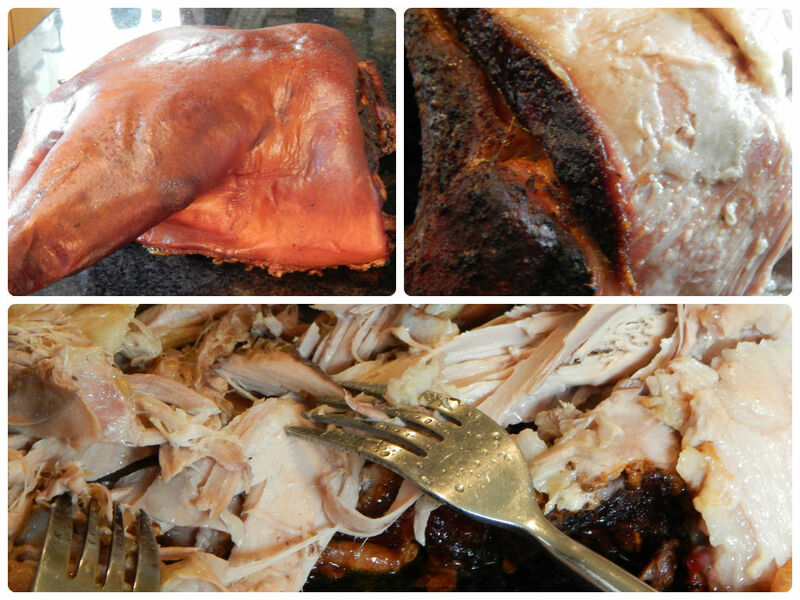 Leave in the refrigerator for at least 8 hours (brining overnight 12+ hours is best). Remove from the fridge and pat dry with paper towels. Place it in a baking tray and begin coating with your dry rub. Your entire shoulder is supposed to be covered in the rub, massage the spices into every part of the shoulder until all mixture is gone. Remember to place your meat so that the fat layer is upper most before cooking. If you have a meat thermometer this would be a perfect time to use it. Place it in the thickest part, close to the bone but without touching it. 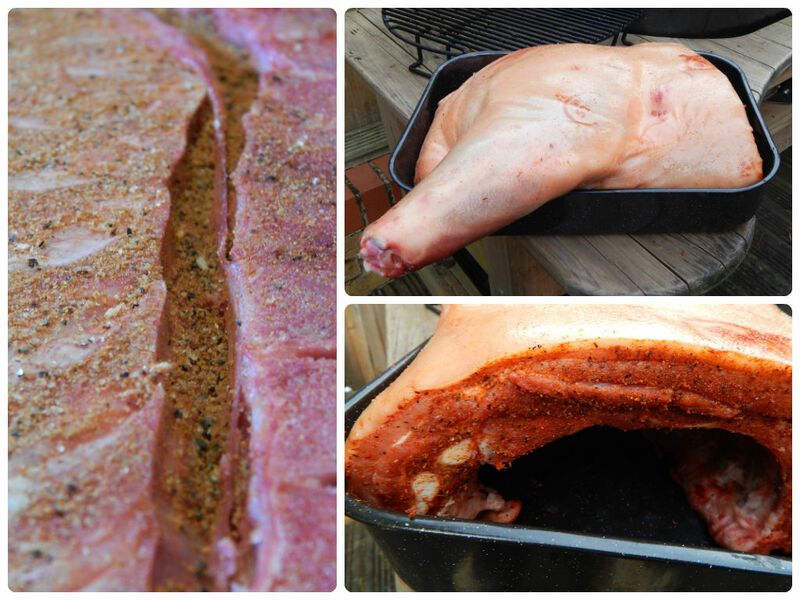 It will help with assessment later on in regards to the readiness of our meat. Now you are ready to cook it. 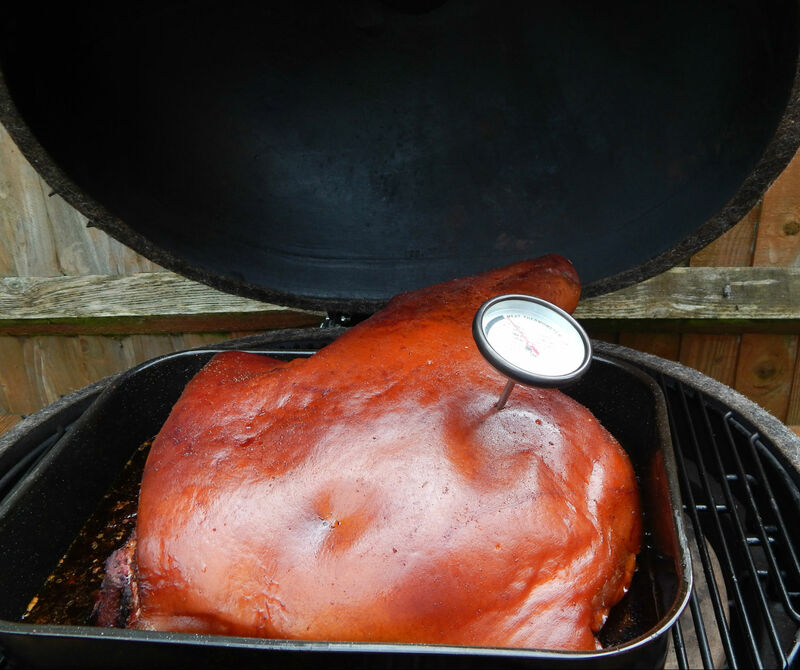 I would put it into my Primo and leave it for about 16-18 hours, cooking low and slow at 110C and adding wood chips every few hours for the additional smoke. You can place it in the over on a shelf. Make sure you can easily see the thermometer. When it hits 93.3C (the internal meat temperature) turn your oven off and leave it inside to cool a bit, this will allow for the meat to relax and all the juices to flood back to the outer edges of the joint. After a couple more hours or so, when the internal meat temperature has dropped to 75C remove from the oven. Place on a dry, large and clean work surface, remove the crust and begin to shred. It should come apart with easy just by using 2 forks. If you are going to use your fingers I recommend some rubber gloves, it will still be very hot! That’s it; nothing less, nothing more. We made our first pulled pork in the oven. We loved it so much but we just couldn’t understand how the same piece of meat from a smoker could taste any better, but believe me the difference is huuuuuge. A proper BBQ / smoker takes it to a totally new level, it’s the smoky taste it speaks to the inner caveperson, it satisfies some primal craving, it is the best way to enjoy cooked meat. Have you ever been on a holiday that was based around the quest for a particular food or dish? OMG! 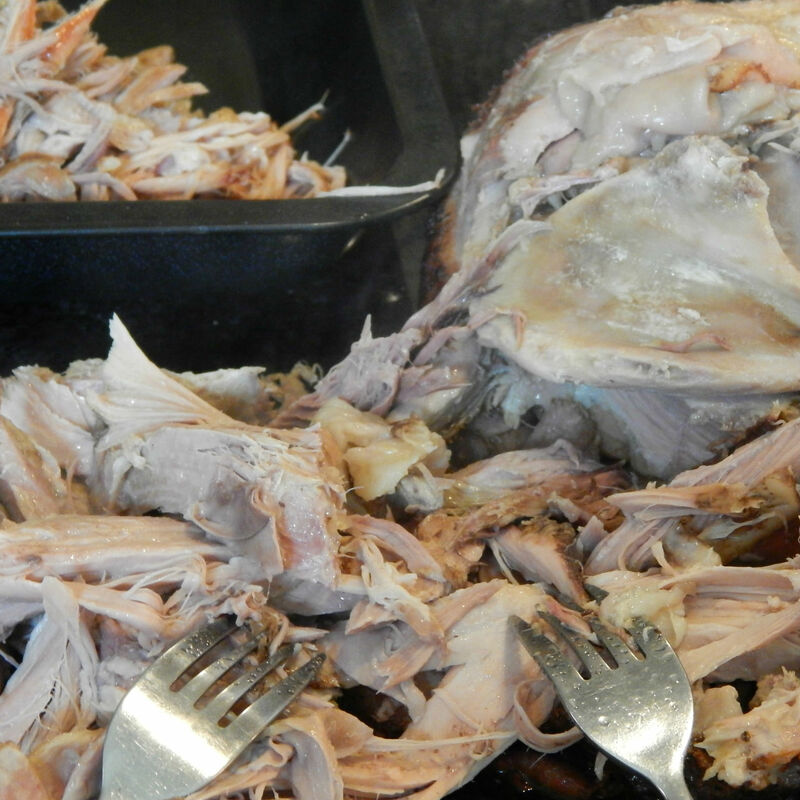 The pulled pork looks to die for. I am seriously craving for some pronto! You bet! Oh my… I would love to try your BBQ. My husband makes pulled pork sometimes. Yum. That sounds so amazing. The pictures look good enough to eat. You don’t have to tell ME about BBQ ~ I live in TEXAS! But, ours is primarily beef here .. I need one of these, we love pulled pork and would love to travel to the USA to sample their amazing foods. One day. Wow that is some dedication to the cause of pulled pork! Believe me it is worth it! sounds gorgeous and does look convincing like the real thing!